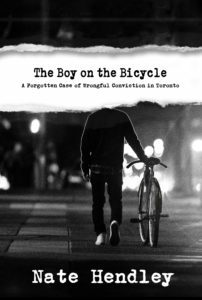 This book is about Ron Moffatt, a 14 year-old Toronto boy wrongly convicted of killing a child in 1956. It’s a true, largely forgotten story involving a coerced confession, fumbled police investigation, a miscarriage of justice and the star lawyer who fought to free Moffatt. Nate Hendley is a Toronto-based freelance journalist, true-crime author and devoted member of the Crime Writers of Canada.